Multi Layer Insulation | Vacuum Insulation	- Meyer Tool & Mfg. Meyer Tool is the source for all your custom MLI project requirements. All of our superinsulation is made from double aluminized mylar, .0005" thick polyethylene terephthalate film, aluminized on both sides with nominal 400 angstroms coating. The vacuum deposited aluminum has an average emissivity of 0.030. Our spacer is a spunbound polyester, .0004" thick. Our superinsulation meets Fermilab and Jefferson Lab specifications. We are capable of making blankets up to a maximum of 60 layers x 82" wide x 154" long (longer lengths available on special request). Contact us today to be connected with someone who understands your MLI project needs! 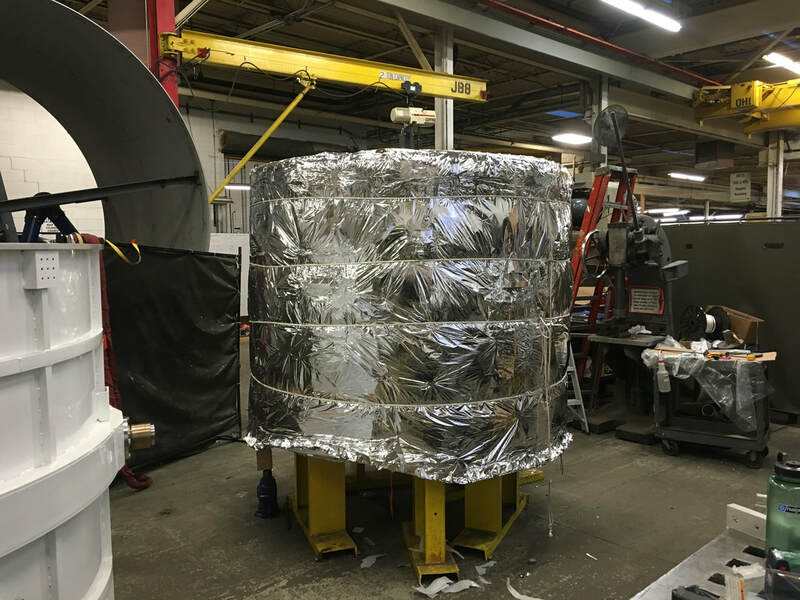 Cryogenic temperatures — defined as those lower than minus 238 degrees Fahrenheit (minus 150 Celsius) — demand special insulation. The most effective technology is multilayer insulation (MLI). It's so effective that NASA specifies its use on spacecraft and satellites. ​MLI is used in vacuum environments where radiation is the main heat transmission mechanism. It consists of alternating layers of aluminized Mylar and spun-bound polyester fabric formed into a blanket. This multilayer insulation works by reflecting radiated heat toward its source. The spun-bound polyester fabric acts as a spacer to inhibit conductive heat transfer between layers, and the vacuum prevents any convection. MLI is often referred to as “vacuum insulation” for this reason. “Super insulation” is another common term that recognizes just how effective it is in extreme environments. While MLI can be used in non-vacuum environments, the presence of gas reduces effectiveness. The performance of multilayer insulation depends on the number of alternating layers in the blanket. A typical number is 60 per inch of thickness. With more layers, more radiant heat is reflected, and the insulating performance is higher. ​MLI is often used in vacuum chambers. Here, it's installed as a blanket that lines the interior of the cavity. It's also used as a wrap around piping and tanks in cryogenic systems such as those used in liquefied gas production. Special installation techniques are needed to avoid compromising performance. Crushing must be prevented as this creates paths for heat to flow. When joining separate pieces, layers must be interleaved, and joints sealed appropriately to minimize heat leaks. MLI vacuum insulation provides unmatched insulating performance within a given thickness; no other material comes close. For maximum effectiveness, it needs a vacuum below 1 milliTorr. It's also lightweight and conforms readily to complex shapes. MLI super insulation is used wherever temperatures are in the cryogenic region and vacuum is achievable. In addition to spaceflight applications, it's used in highly specialized low-temperature scientific and research equipment such as vacuum chambers. Another application area is the production and storage of liquefied gasses. ​People call MLI super or vacuum insulation for a very good reason: In vacuum, no other insulating material comes close. At Meyer Tool & Mfg., we can fabricate custom MLI blankets as a standalone product. We can also integrate MLI into custom-designed cryogenic vacuum chamber systems. To learn more, call 708-425-9080 or complete our project request form. Either method will quickly get you speaking with a technical specialist.